thecasiostore has no other items for sale. Sales tax may apply when shipping to: AR*(6.5%), IA*, MN*, TX(8.25%), WA*. Fast shipping!!! Great seller!!! Highly recommended!!! The best of the best sellers thank you. Great Ebayer!! Fast Shipper!! Highly Recommended!! I know that the all black is the tough one to read. Black background with white letters in the digital are next to impossible to read unless in direct sunlight. I knew that going in due to a couple G-Shocks I own. I just loved the look of all black. Keeps good time and the analog is a quick read which is my main desire. Oddly, when I set the time the analog is exactly one hour faster than the digital. I still have to figure that out! The World Time and G-Shocks are fun watches. The World Time are a fraction of the cost. I use them primarily when cycling. Awesome watch. 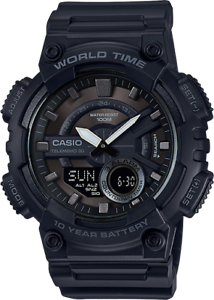 My first casio. And won't be my last.